I have been trying to learn how to paint digitally. 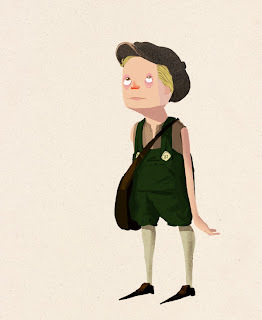 Here is a little boy that ended up being a collage/digitalpaint. I over worked some areas and under worked others. If you know how to paint in Photoshop shoot me an email with any pointers. Good luck with your post summer plans! looking tight man! the only thing I would alter or be mindful of is his silhouette. the overall tone of his overalls and satchel are to similar - thought he had a pot belly at first glance.